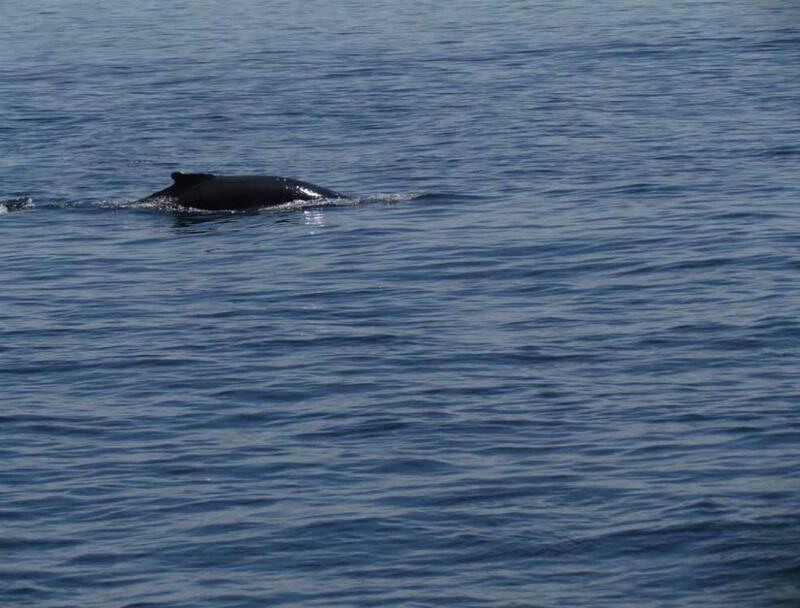 pictures that I took on July 8, 2011. 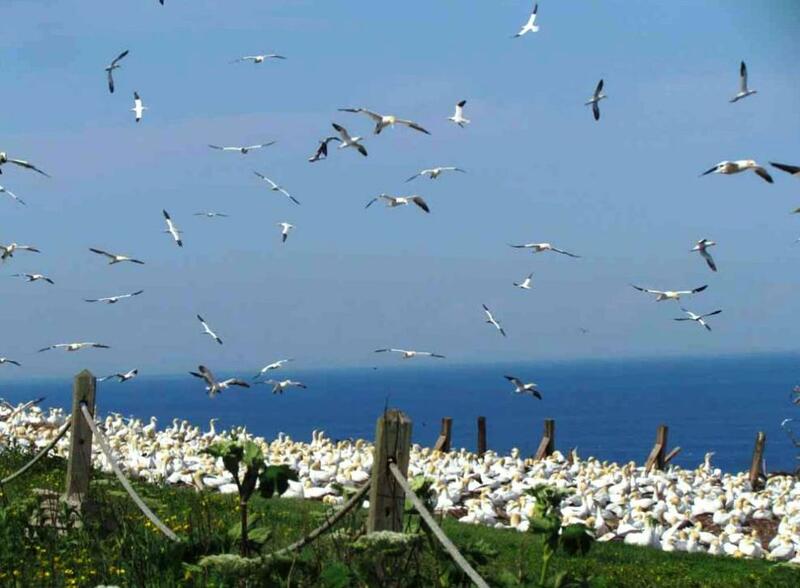 11-day tour will be presented in the subsequent web pages. 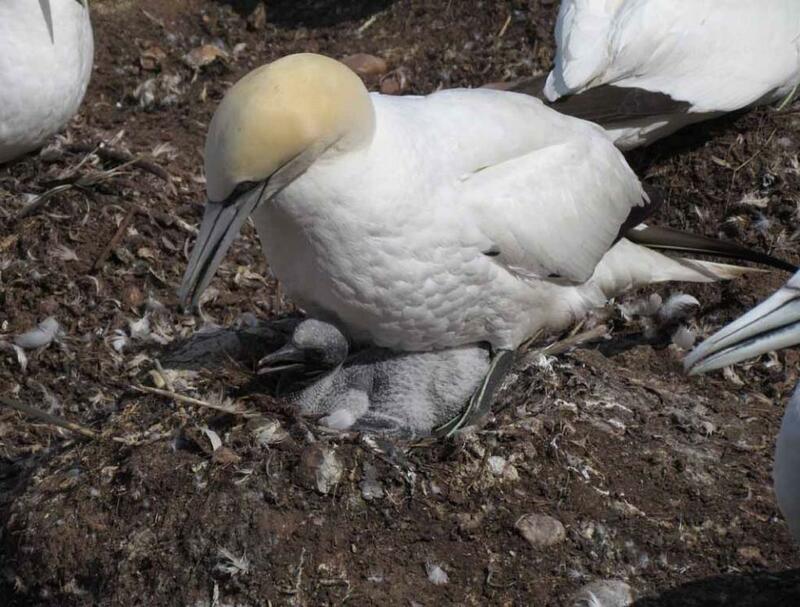 A baby gannet being protected by its parent in the nest. I took onto the YouTube website. 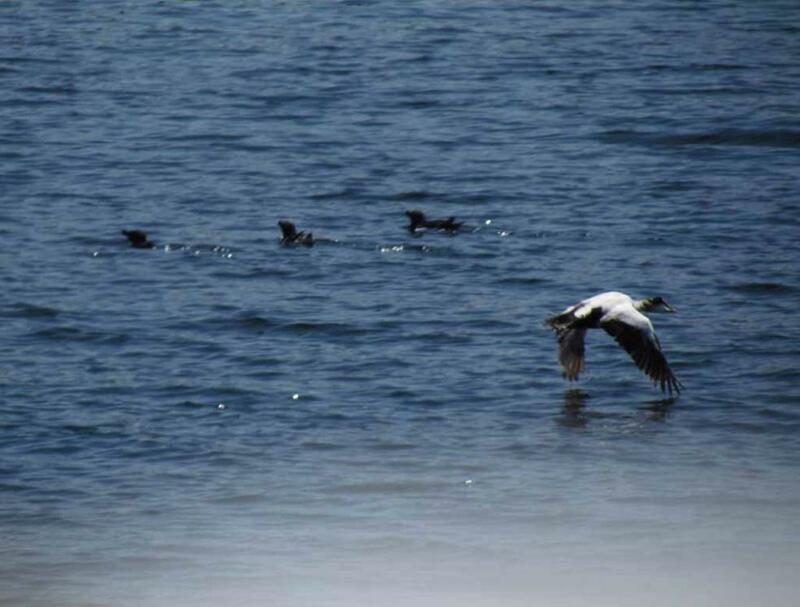 water surface and take off to fly back to their nesting area on Bonaventure Island to feed their baby birds. 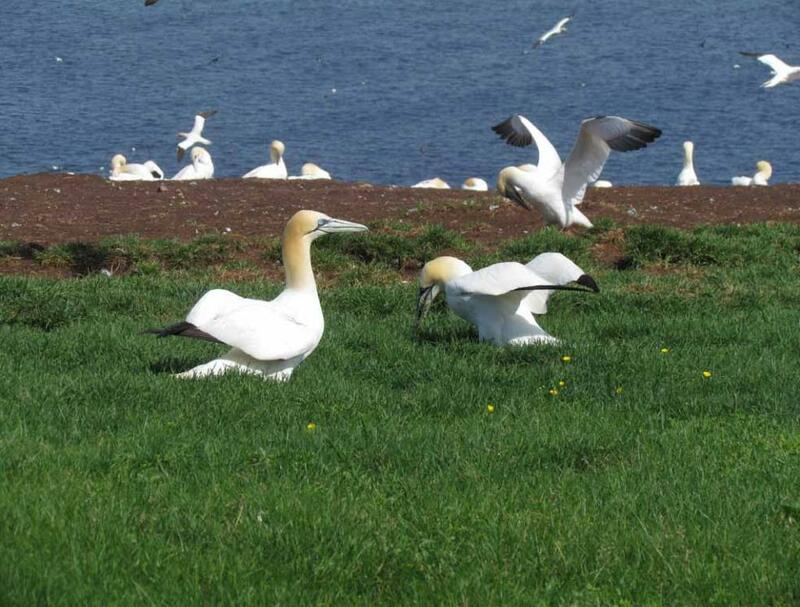 These returning gannets are flying from left to right on these movie frames. 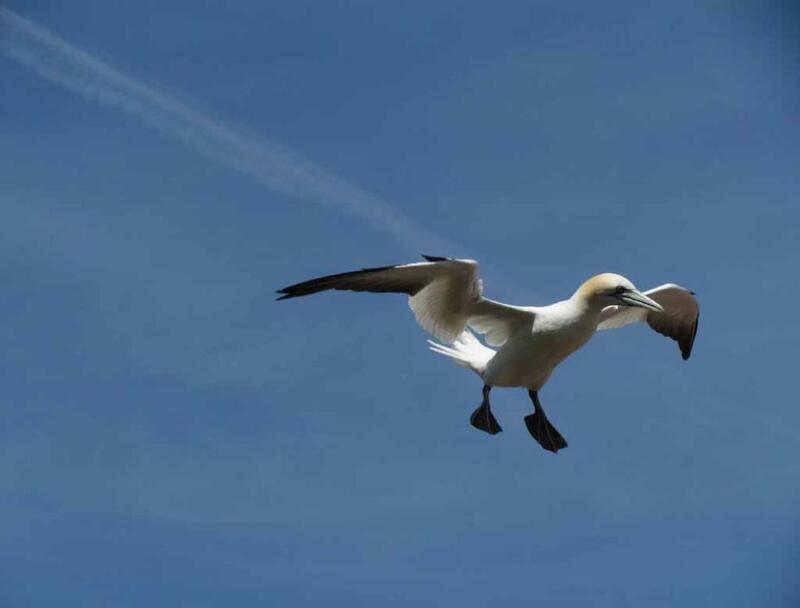 catch fish and flying back to the nests to feed the baby gannets. 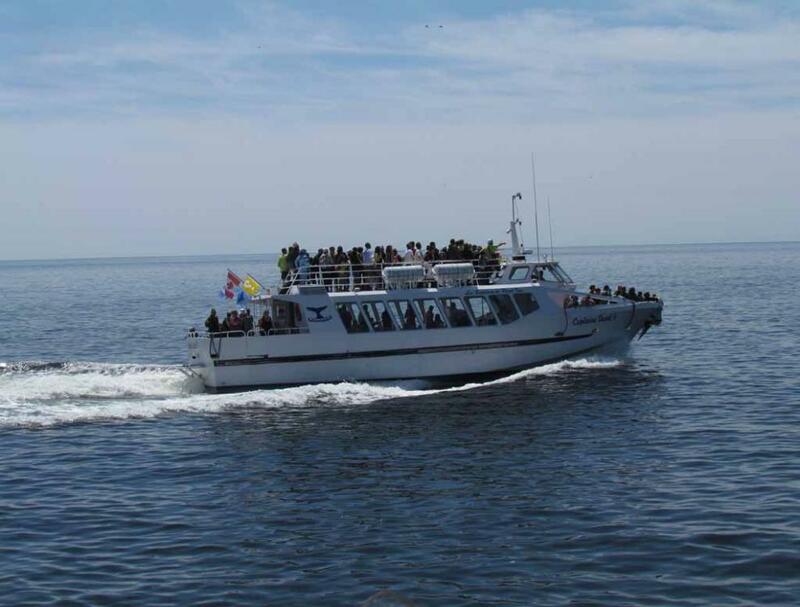 season, the tour boats operate from 8 AM to 5 PM. 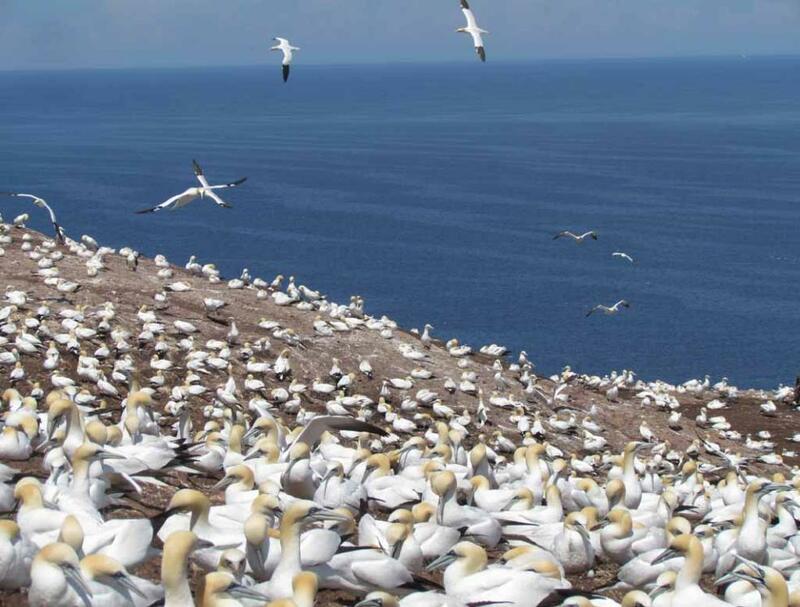 No reservation is necessary. 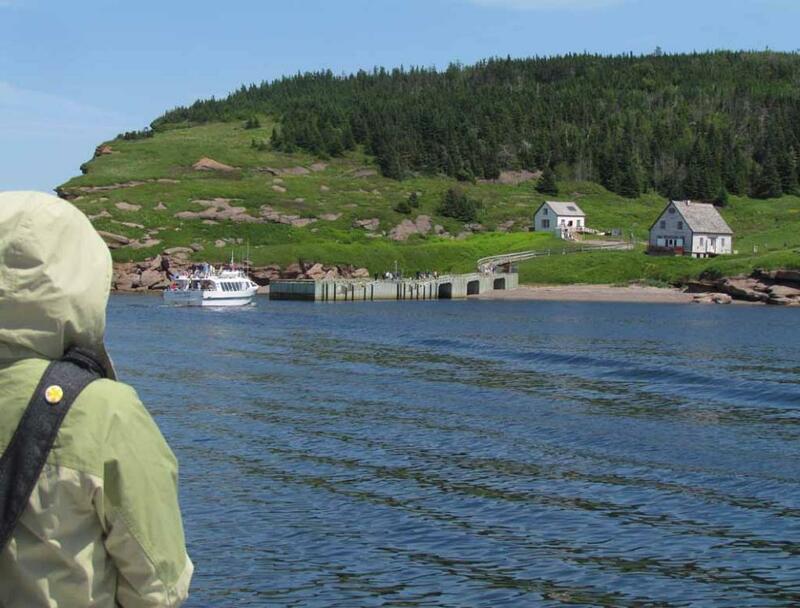 One of several tour boats carrying visitors from the village of Perce to Bonaventure Island. 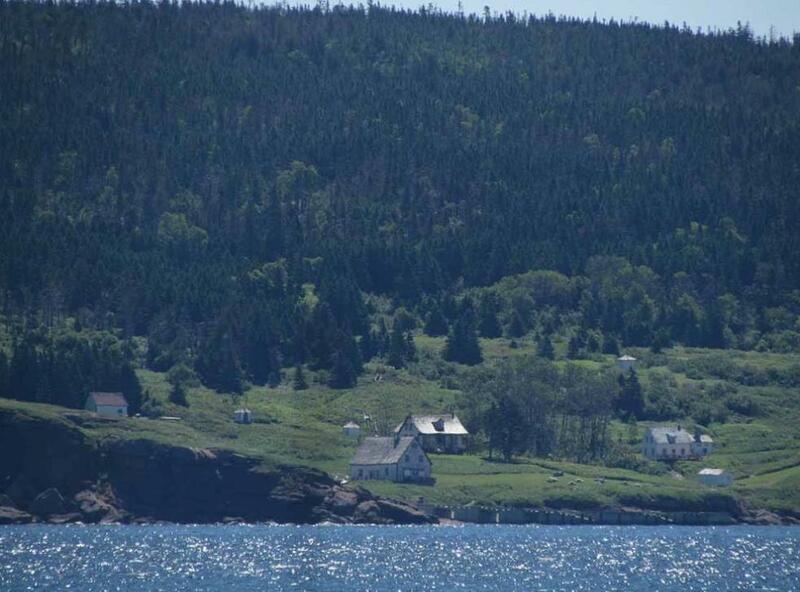 Mountain and cliff on northern end of the village of Perce as viewed from the Bonaventure Island. 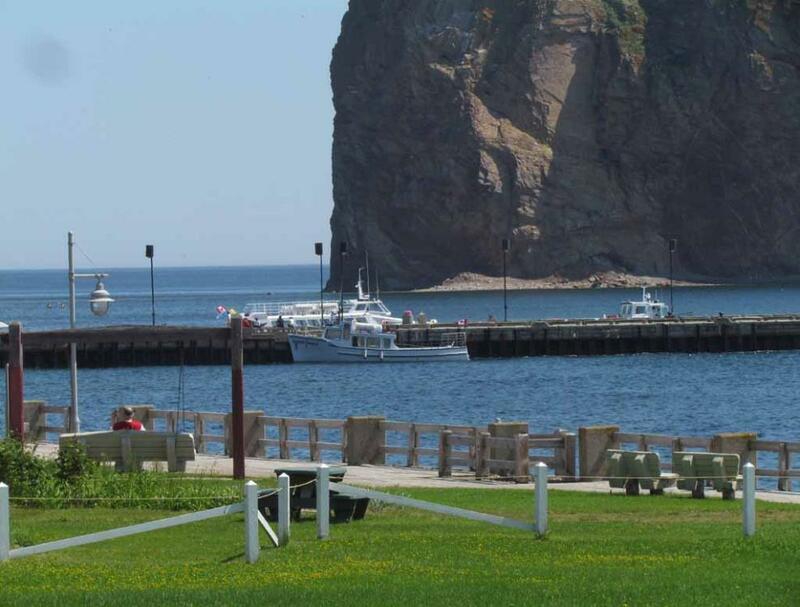 The boardwalk, the marina and the Perce Rock as viewed from Hotel La Normandie in the village of Perce. came crushing down in 1845. 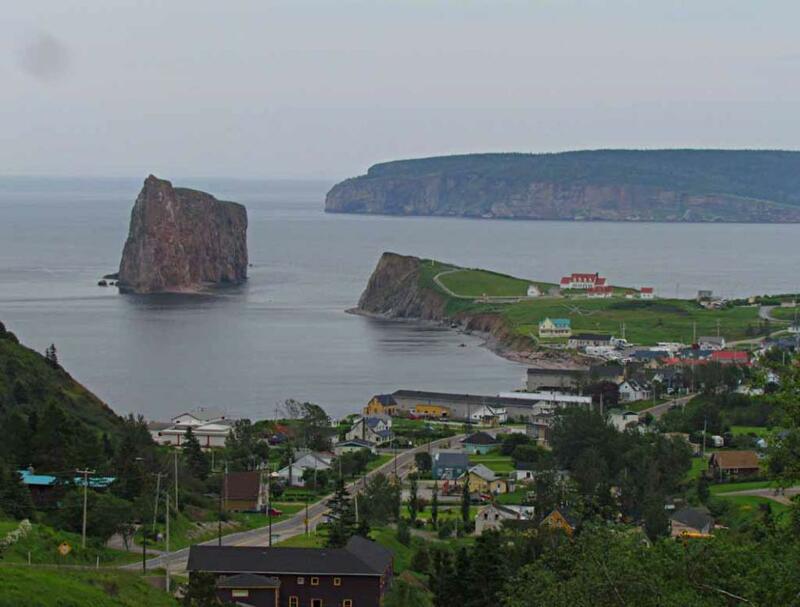 Percé. 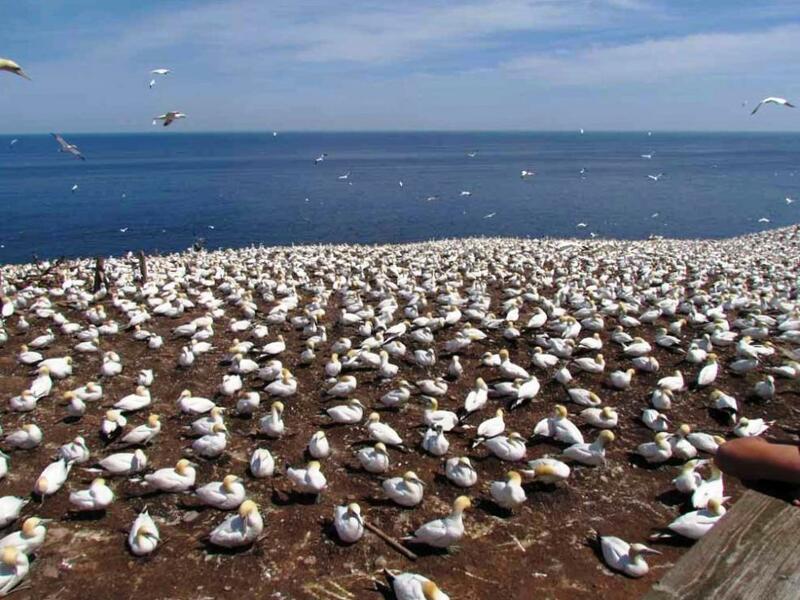 Bonaventure Island and the Village of Perce are about 1090 km east of Montreal. 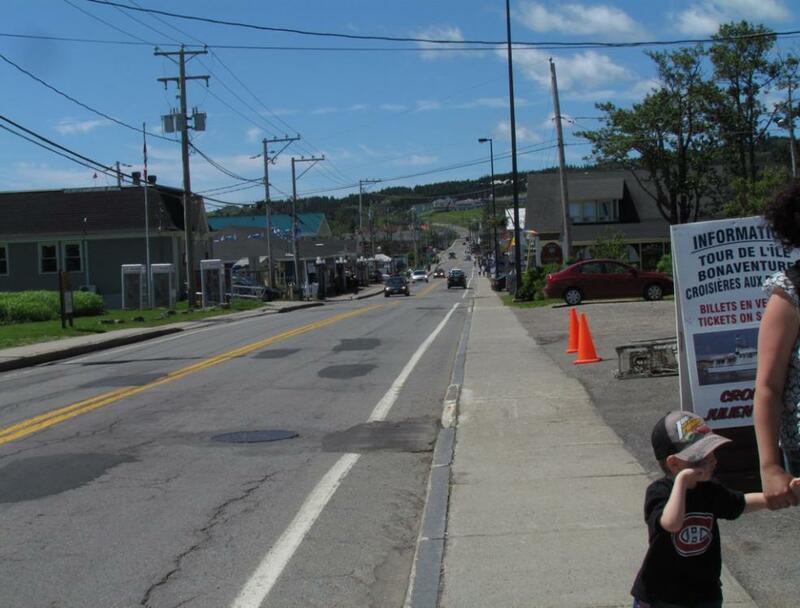 From Montreal, take highway 20 going East toward Quebec City along south shore of St. Lawrence River. 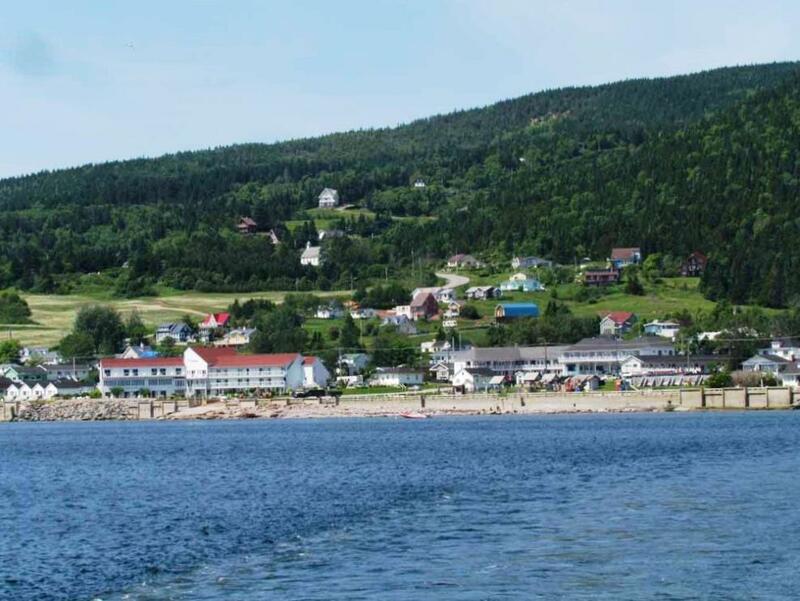 East (On north coast of Gaspe Peninsula) all the way to reach the village of Perce. 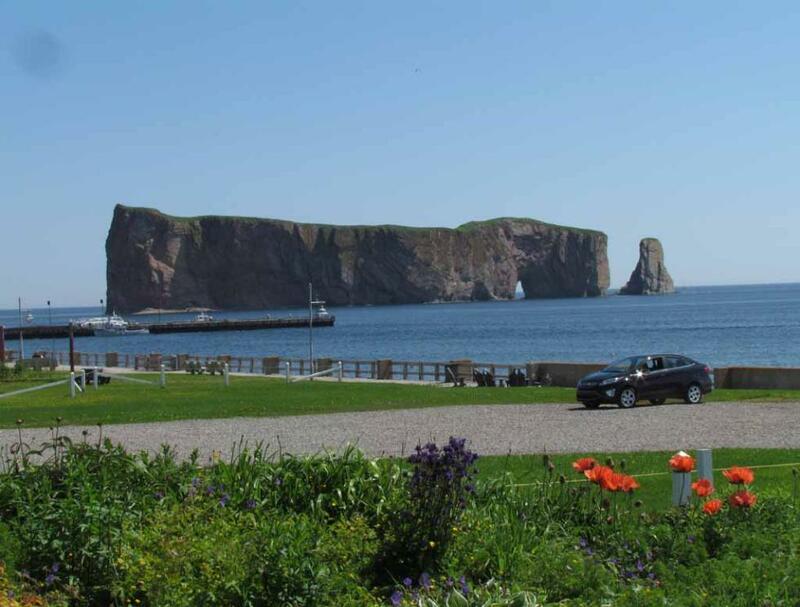 Chaleurs Bay on southern coast of Gaspe Peninsula to reach Percé. 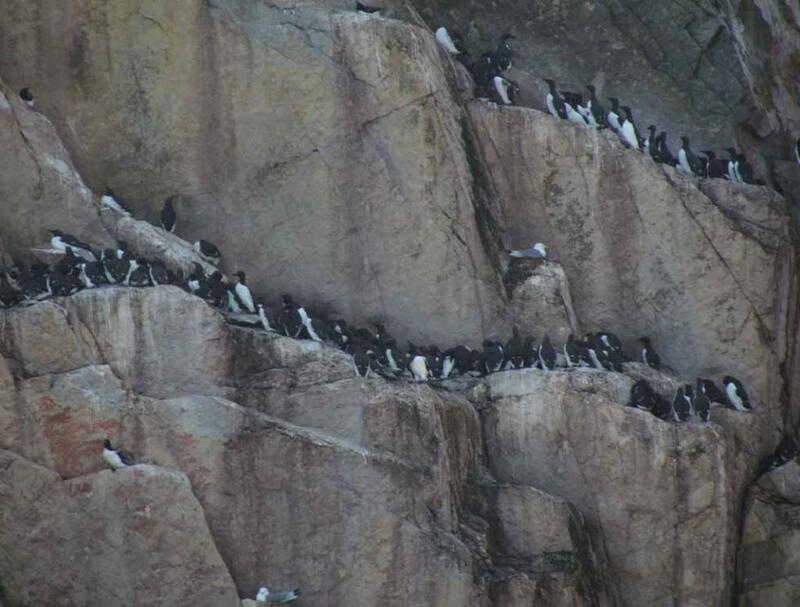 tables and toilet facilities. 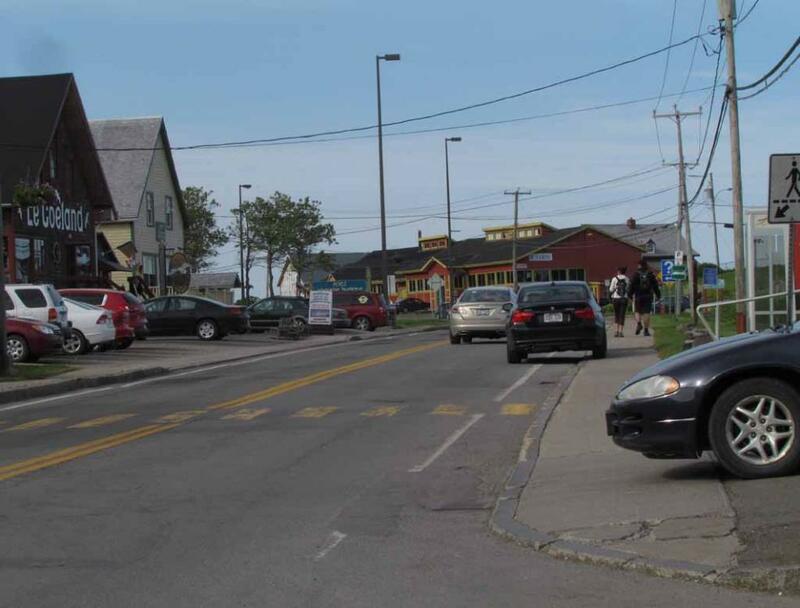 Each little fishing town is unique and every curve in the road brings fresh delights. 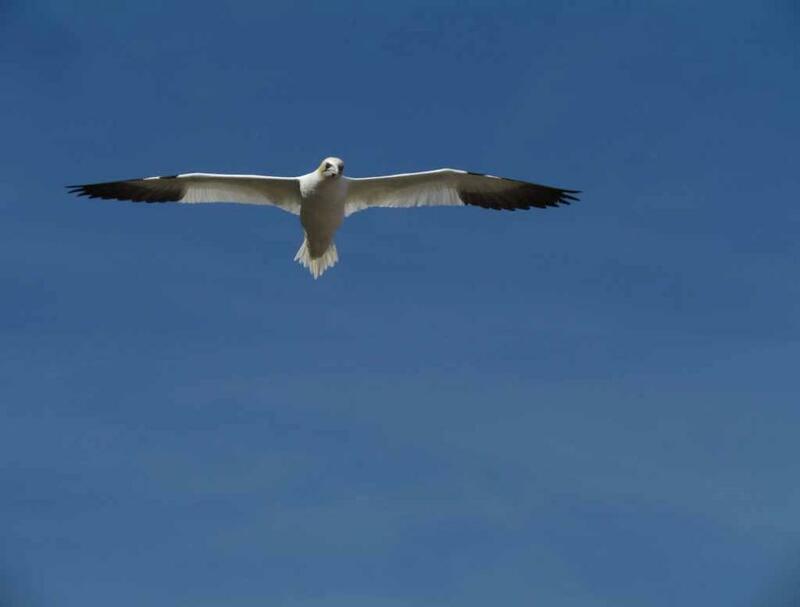 glide to the meadow below. of drinking water just in case if you get hungry or thirsty but there is no town or village in sight. The AAA tour book for Quebec also has a shorter list of Quebec's French Road Signs. Quebec with French Road Signs and French street/road names. 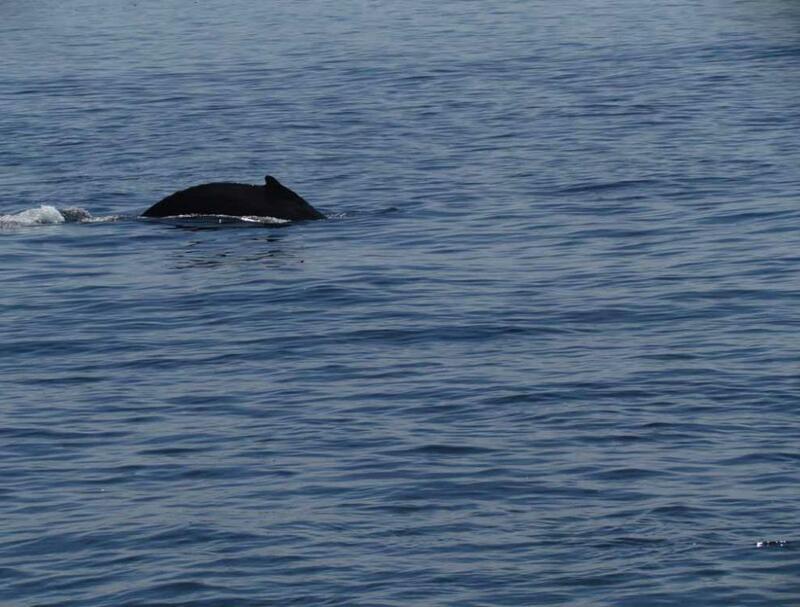 from the blowhole, the back fin, the arching back, and then the tail. 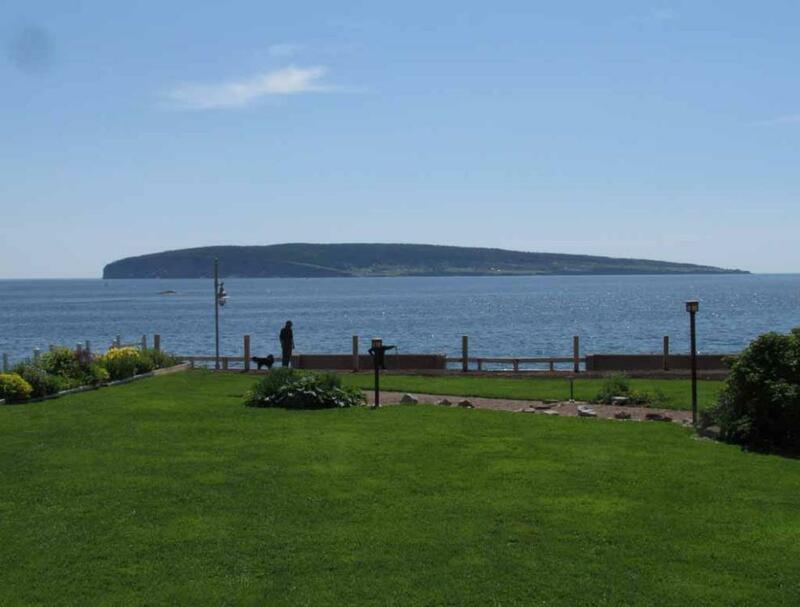 Bonaventure Island viewed from the Hotel La Normandie in the village of Perce. 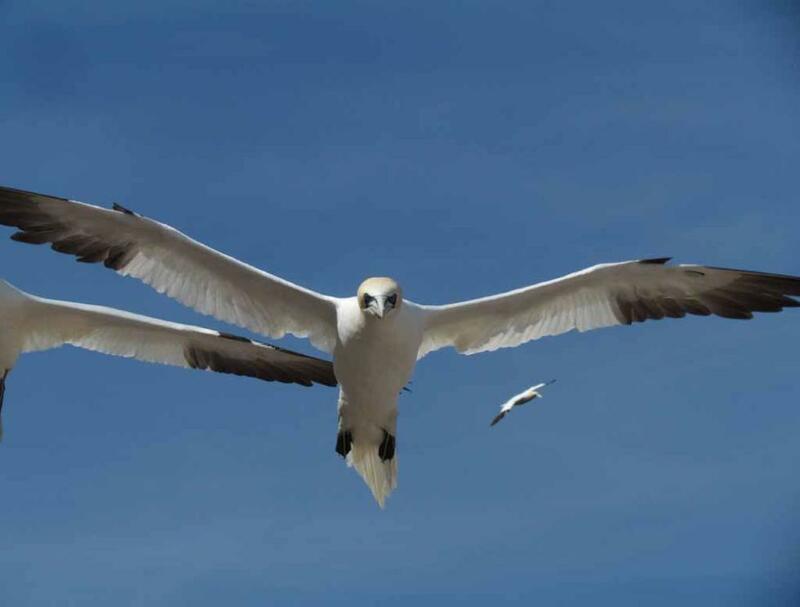 A gannet in flight above the nesting area. 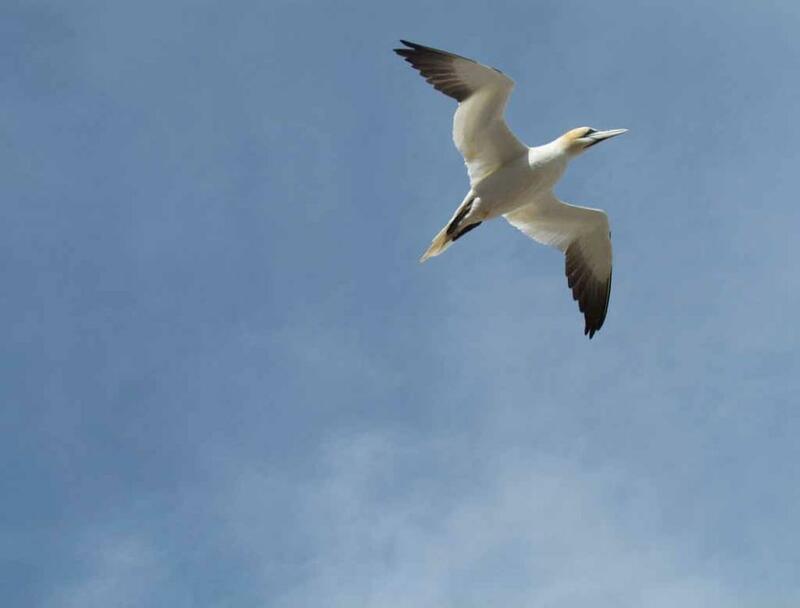 Gannet is a big seabird with a wingspan of 6 feet. 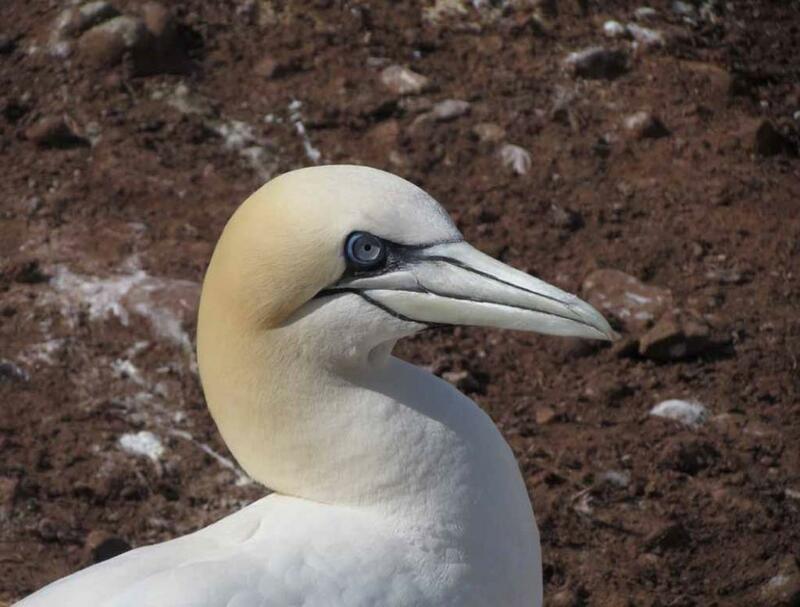 Zoom in for a close up view of the head of a gannet. 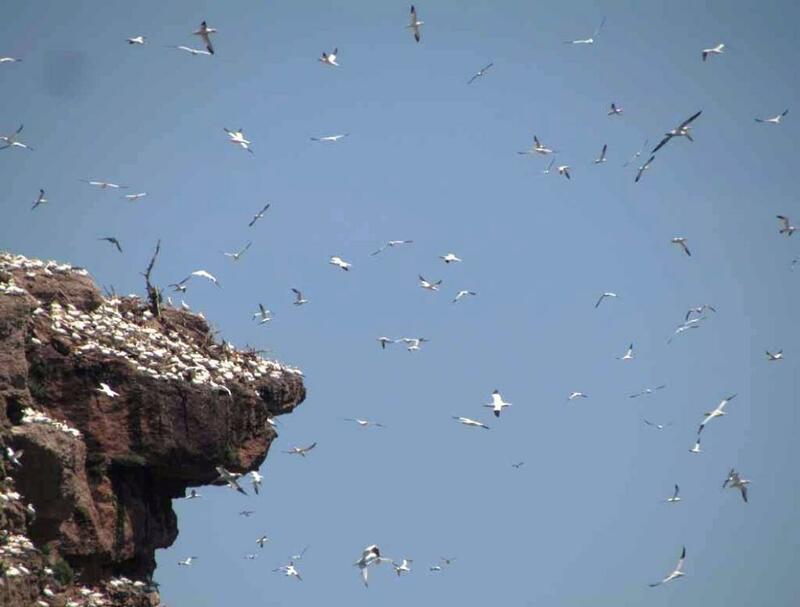 Many gannets were flying above the nesting area in addition to many gannets on the nesting area. 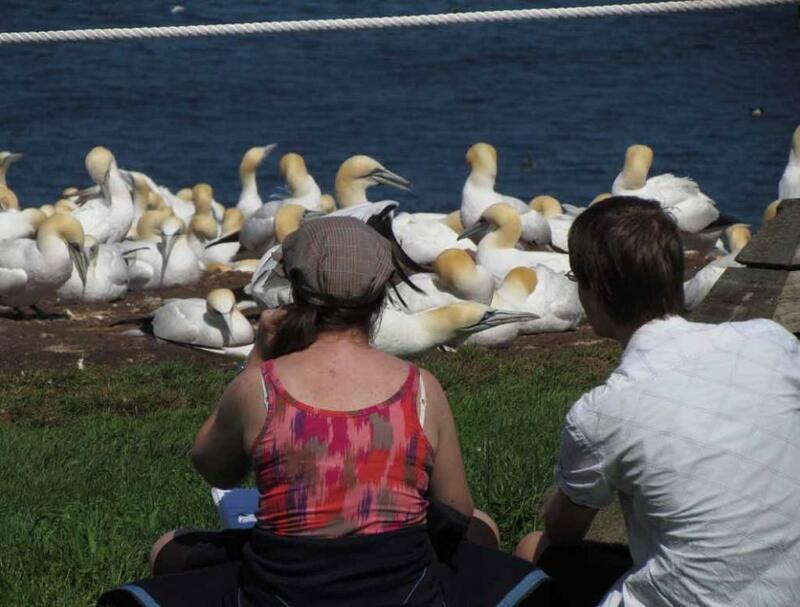 Visitors are allowed to get very close to about 5 feet distance from the protected nesting area of gannets. 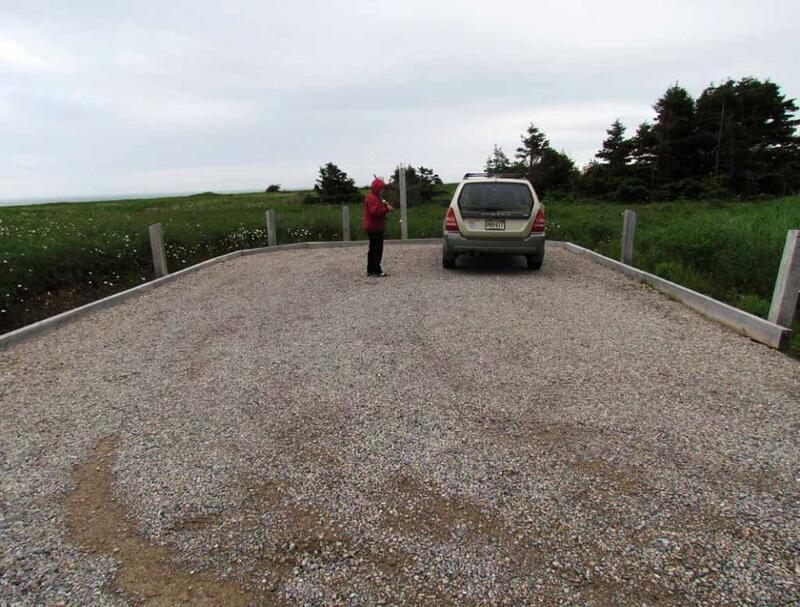 Map: Click here to see a detailed park map with 4 hiking trails on Bonaventure Island. 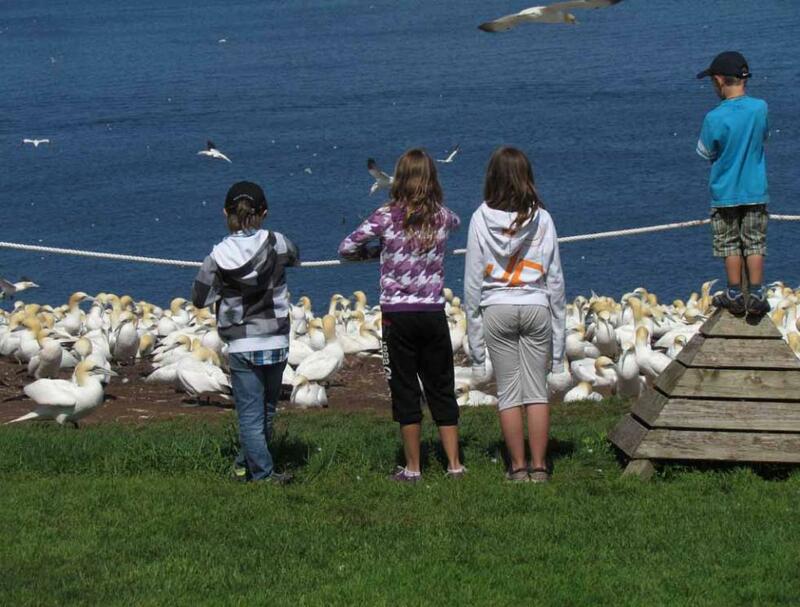 ticket to tour the National Park of Bonaventure Island and Perce Rock. water in my backpack, instead. 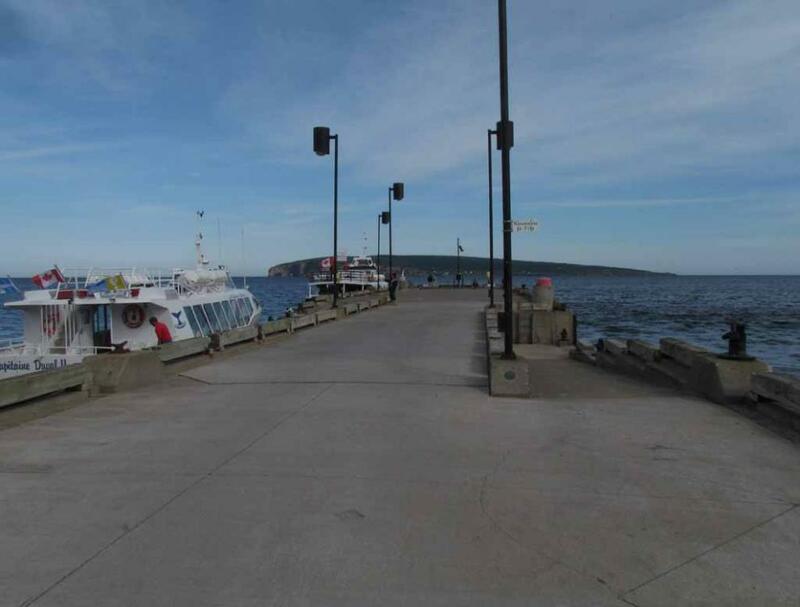 stores and ticket offices for tourists to buy tour boat tickets to tour Bonaventure Island. 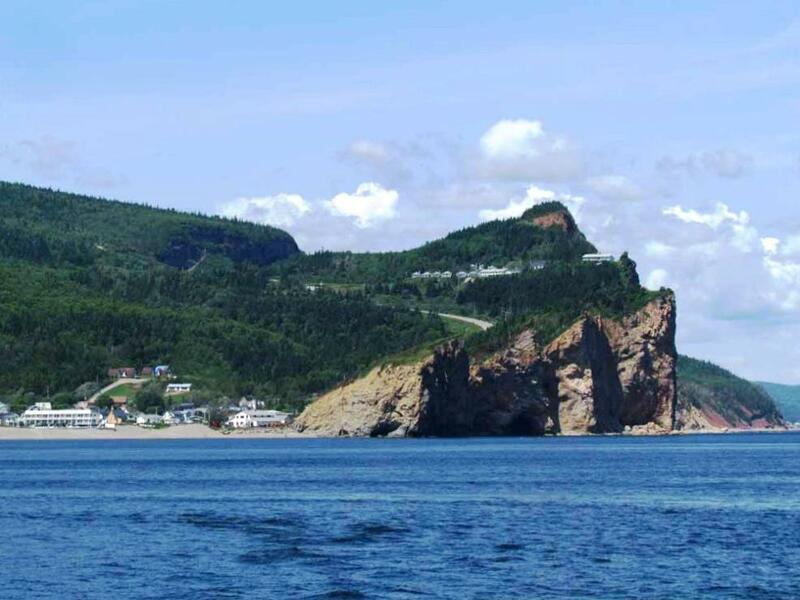 climbing up the mountain behind the village of Perce. 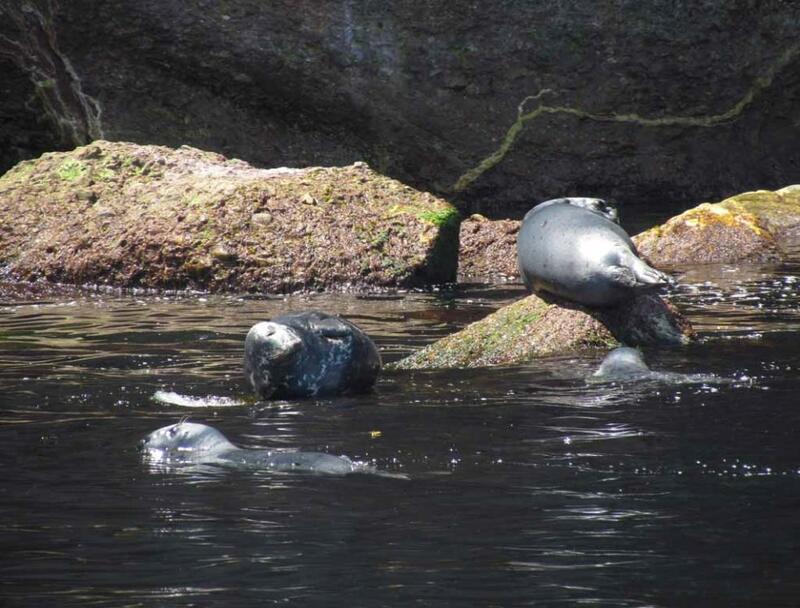 From the tour boat, we also saw several seals at the base of the cliff of Bonaventure Island. 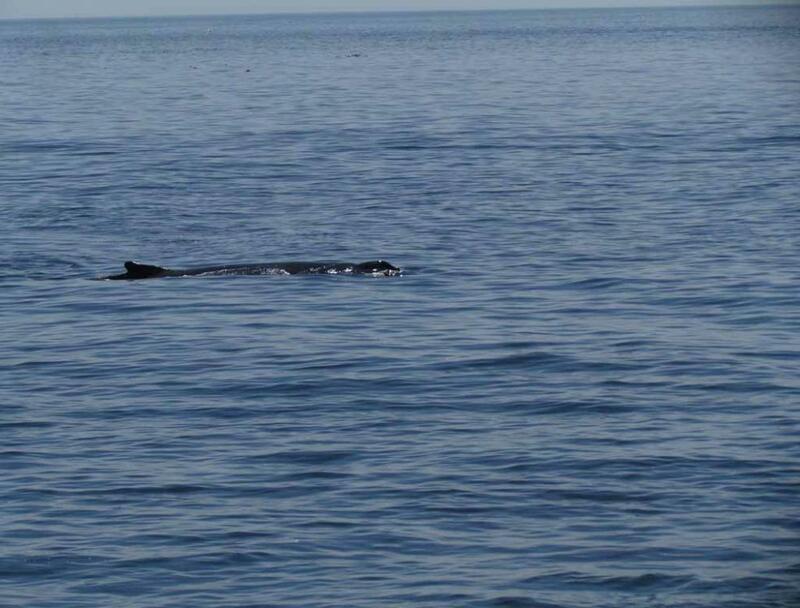 spawn between June and July. 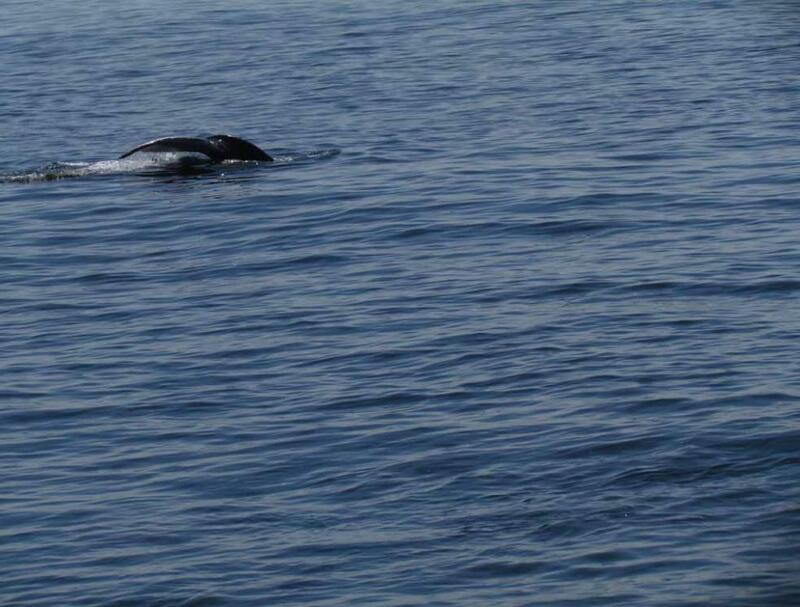 High tide and waves carry many spawning capelins right up to the beaches. window to see this fantastic event. 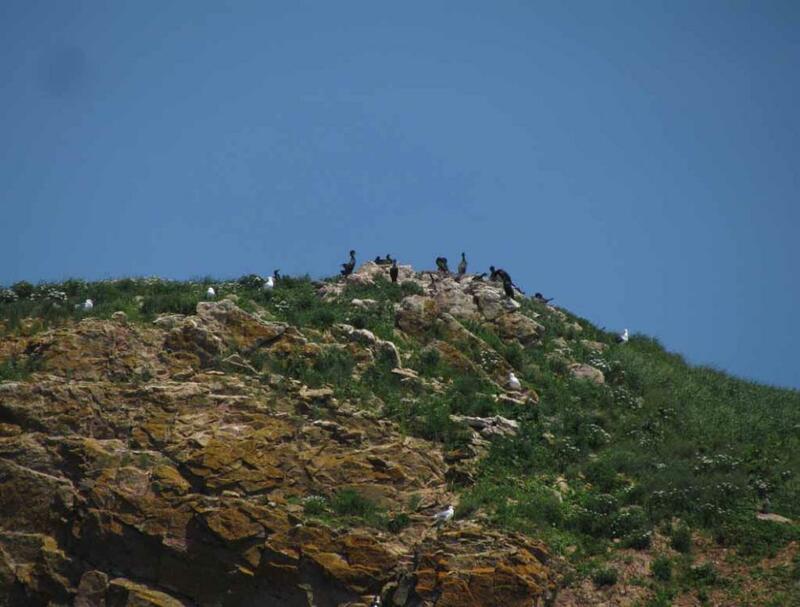 telescope or a super-zoom camera is necessary to see them well if it happens. the big road sign of Motel Suisse. 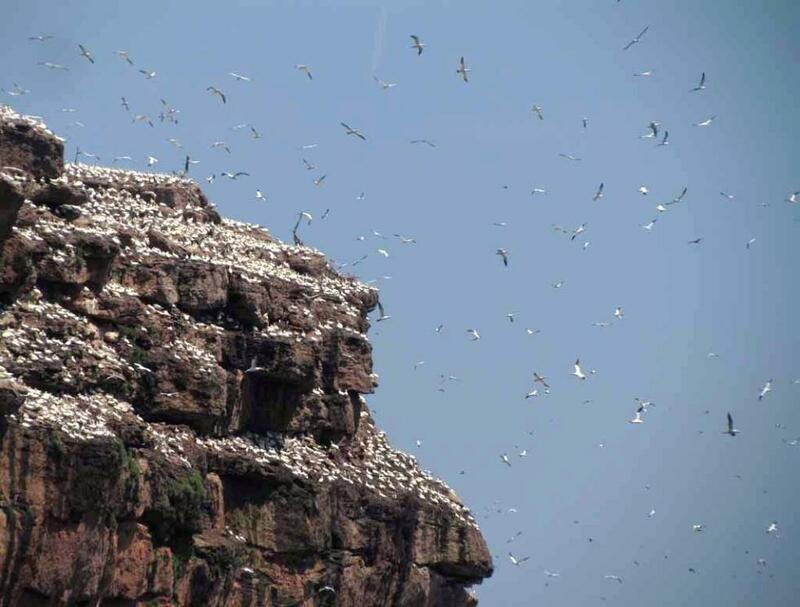 Many seabirds nesting on the cliff of Perce Rock. 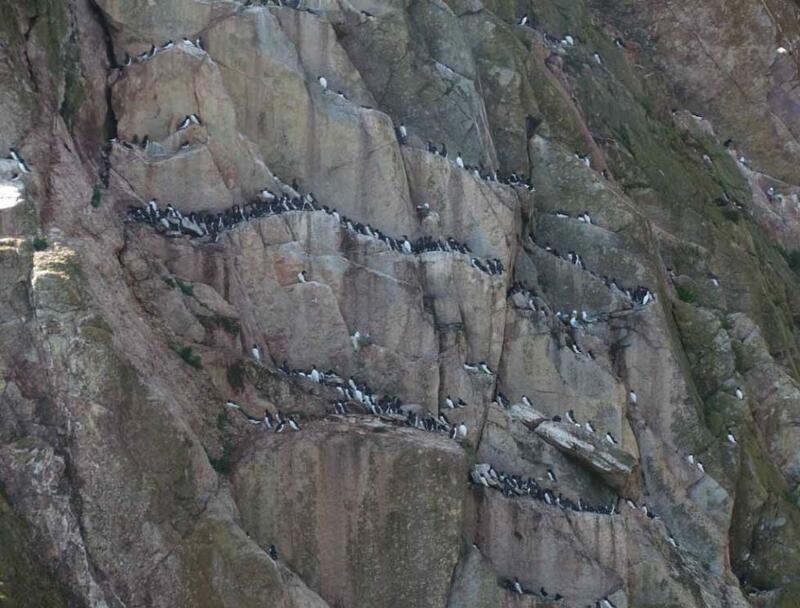 to cover such a large cliff area with so many seabirds spreading out on the cliff. 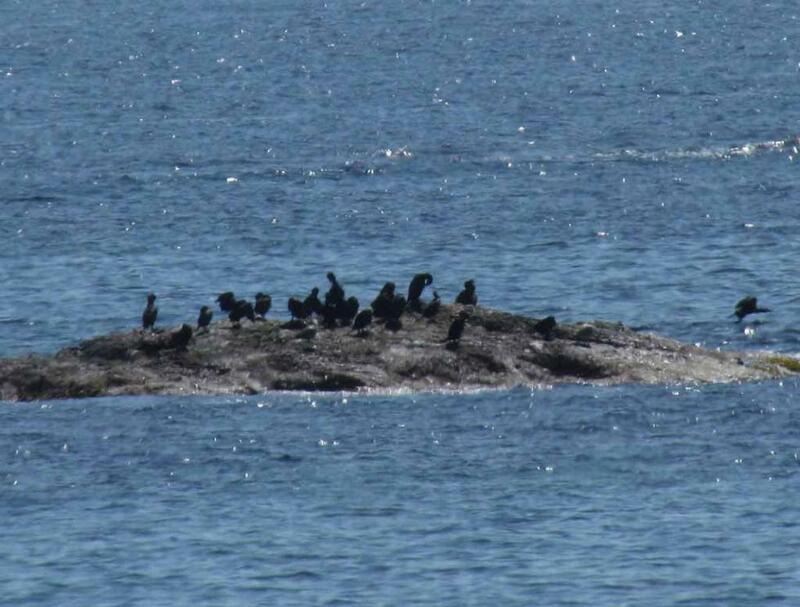 There are also many cormorants in this area. 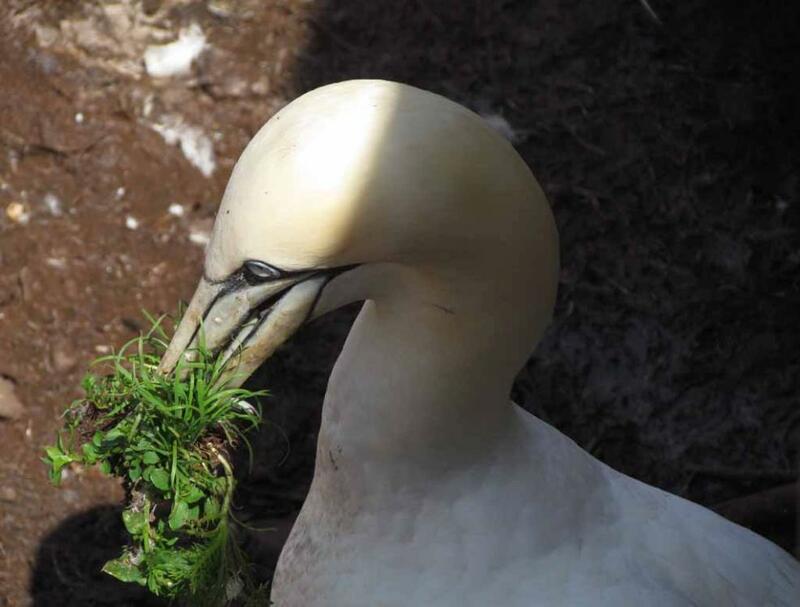 Some gannets are pulling up grass here on the grassy area to be used as nesting material. 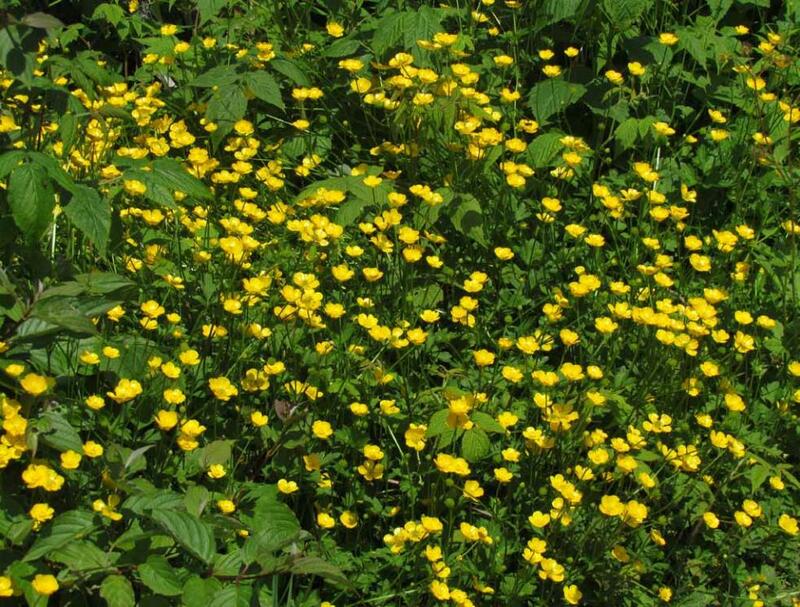 Many yellow flowers along the hiking trails on Bonaventure Island. 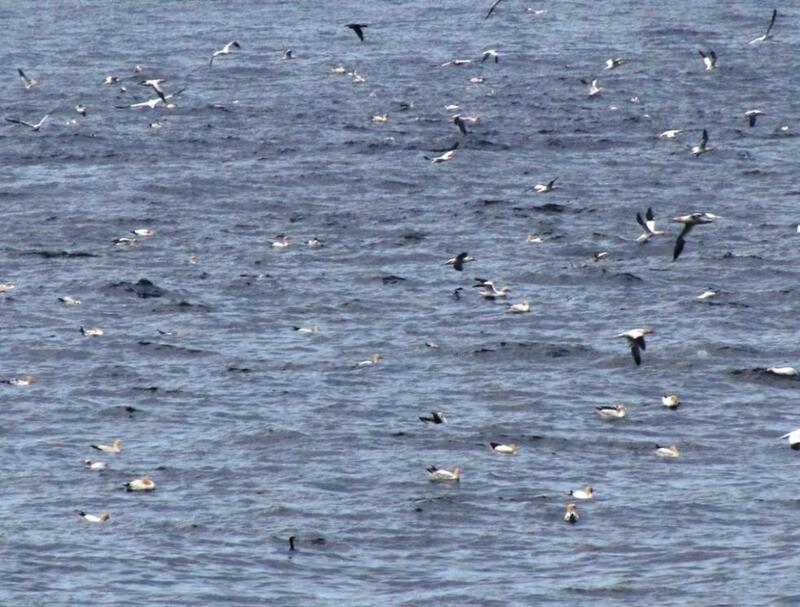 A seabird, may be common eider, in flight just above water. 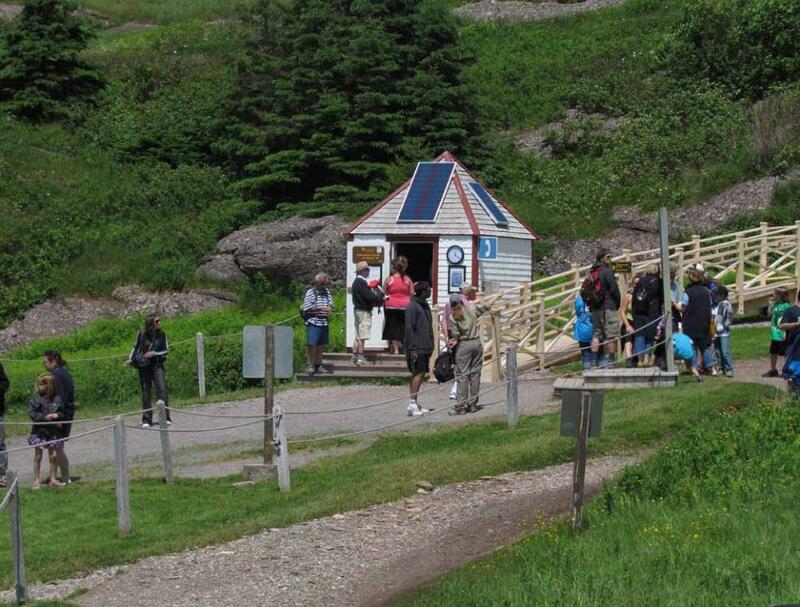 are hiking from the marina almost at the sea level up to the top of Bonaventure Island as shown on this picture. 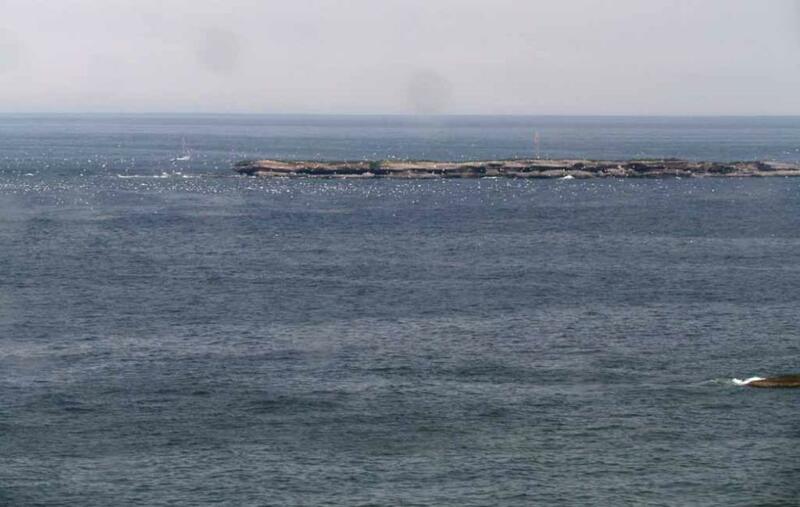 One can see the height of the top of Bonaventure Island relative to those few houses near the small marina. 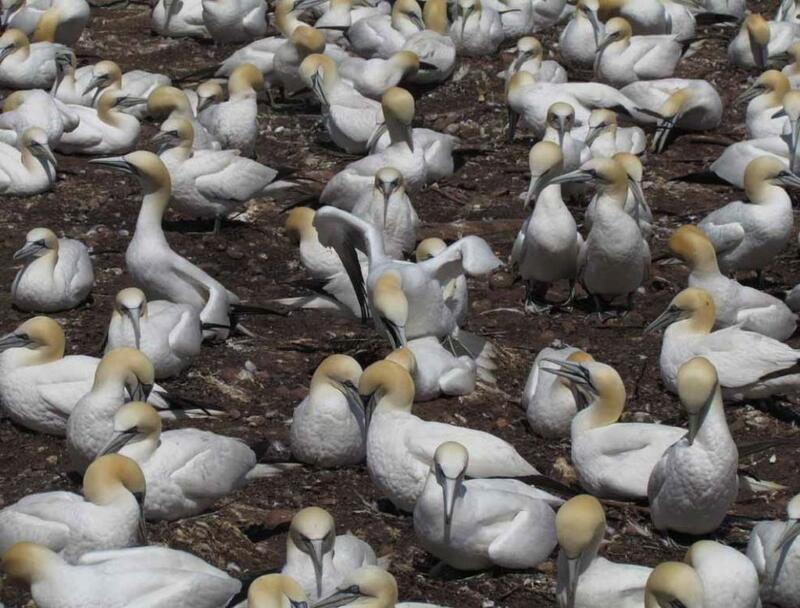 on the large school of fish in the area near Pointe Saint Pierre.